Chef to the stars wins Wales Care Award | News by Wales Express News, People Before Profit! A chef who’s cooked for the Queen, top politicians, celebrities and sports stars has won a top award for driving up culinary standards at South Wales care homes. Hugely-experienced in the kitchen, Brian Lane, who works for industry-leading care provider, Hallmark Care Homes, has also been a judge in the preliminary rounds for those seeking to be crowned TV’s MasterChef. Now the chef to the stars has been declared winner of the gold Wales Care Award in the category for Commitment to Quality in Housekeeping and Hospitality which was sponsored by Care Inn Ltd. The MC for the evening was opera singer Wynne Evans, aka Gio Compario from the televisions adverts for Go Compare and the main sponsors were Ontex Healthcare and Barchester Jobs. Brian is executive chef for Hallmark and for the last 18 months has supported a team of 40 chefs at 16 homes with their menus, working alongside them in the kitchen and creating cookery workshops where the chefs can gain further knowledge and improve their existing skills. His and the kitchen teams’ efforts are paying dividends for residents of a string of homes in South Wales, including Cartref Annwyl Fan Care Home in Betws, Bryn Celyn Care Home in Maesteg, Regency House Care Home in the Ely area of Cardiff, Shire Hall Care Home in Cardiff, Ty Enfys Care Home in Cardiff, Cherry Tree Care Home in Caldicot and Greenhill Manor Care Home in Pentrebach. He’s brought to the care sector a wealth of creative culinary experience from working with household-name Michelin star chefs, including Tom Kerridge. 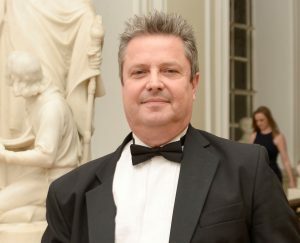 Brian, of Reigate in Surrey, has worked at St James’s Palace and TVAM, catering for the dining needs of a raft of dignitaries and famous names. His knowledge and teaching skills are now proving to be a recipe for success in the social care sector. While passionate about quality, Brian takes a different approach to that seen in ‘Hell’s Kitchen.’ Colleagues describe Brian as patient, while he pushes the boundaries – trying fresh ideas to enhance the mealtime experience for residents. One colleague described him as the best chef with whom he had worked, his love of food “a joy” and his craft skill “immense.” Meeting the culinary needs of residents in care homes can present an extra challenge, but since he joined Hallmark, Brian has improved the quality of food that chefs produce, teaching them new skills such as how to make softer foods aesthetically pleasing as well as much loved desserts and homemade baking treats. He said: “I go around all of the homes, to mentor and motivate Hallmark Care Homes chefs to deliver outstanding, exciting and well-presented food to the residents. “My workshops look at creating delicious sauces, pastries, baked goods, hot and cold desserts and meals suitable for those living with dementia. “I enjoy working alongside my team and I like to think I treat my colleagues with respect, you are not going to achieve anything by bellowing at anyone and if you do a good job with your colleagues on the frontline, the residents will benefit! Mario Kreft, the Chair of Care Forum Wales, said the standard of entries was extremely high. Next articleUS Stock Markets & Cryptos Crashing… Is This The Big One?